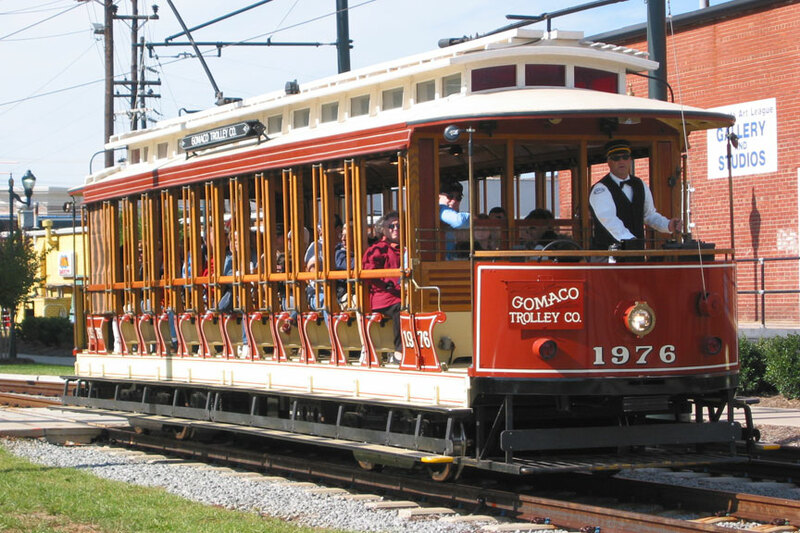 Gomaco Trolley Company began building trolley cars in 1982 with a contract from the Department of the Interior. 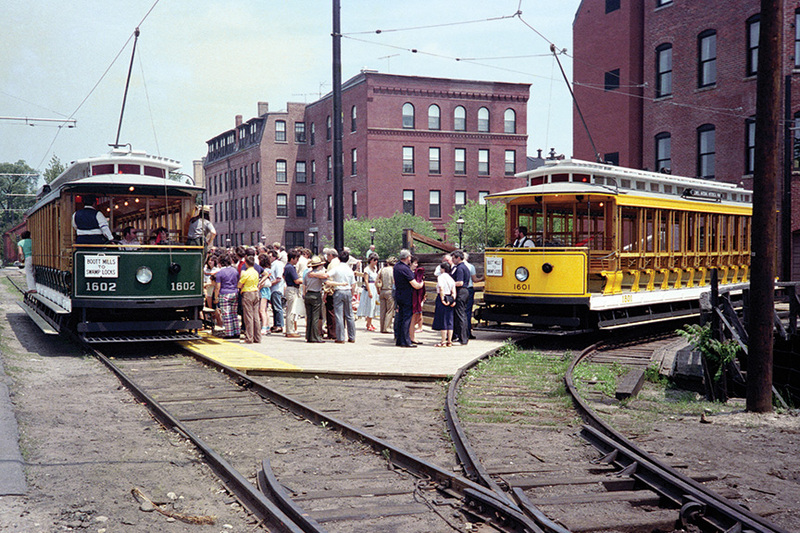 This contract called for the construction of two open-style, double-truck trolley cars for the Lowell National Historical Park in Lowell, Massachusetts. 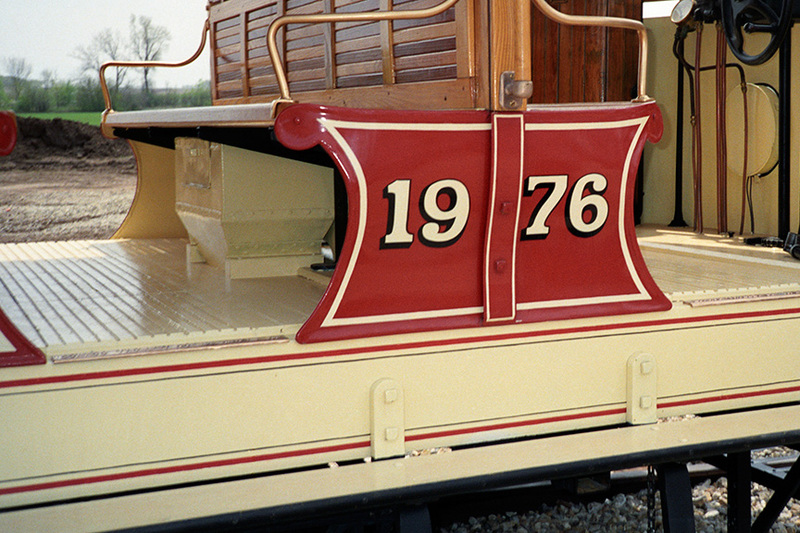 The cars, numbered #1601 and #1602, were delivered in 1984. 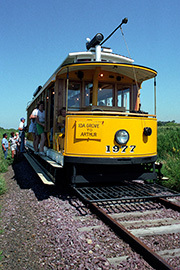 In 1986, open-style car #1976 was constructed. 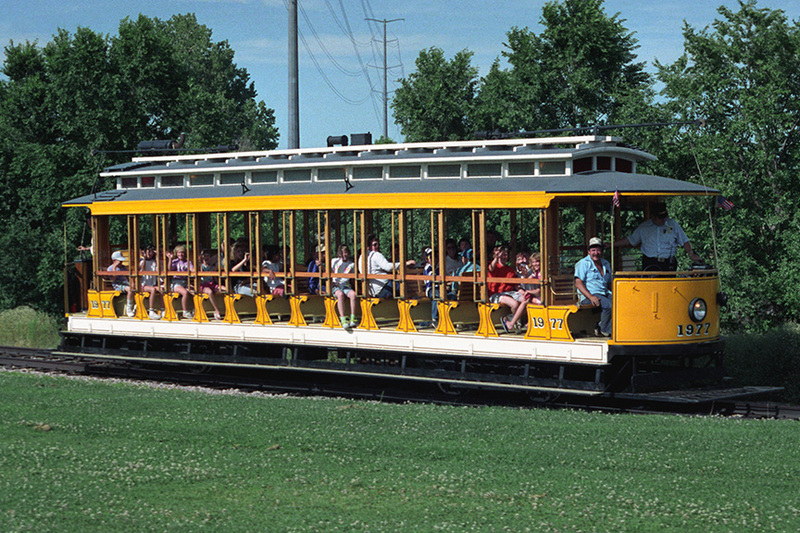 It operated for several years for the Mason City-Clear Lake Historical Railway Society in Mason City, Iowa, and is currently in Tampa, Florida. In 1988, open-style car #1977 was built for local use. 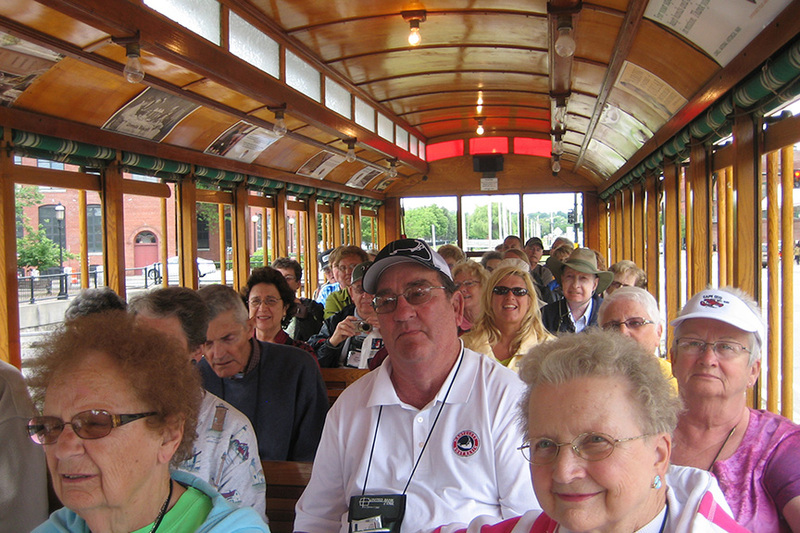 This was a self-propelled trolley with an on-board generator unit. 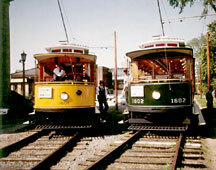 It was leased to the Denver Tramway Heritage Society in Denver, Colorado, starting in 1989. 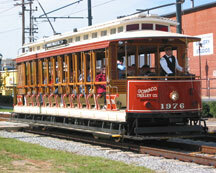 These cars are authentic reproductions of the 1597-1600 series cars manufactured by J.G. Brill Company. 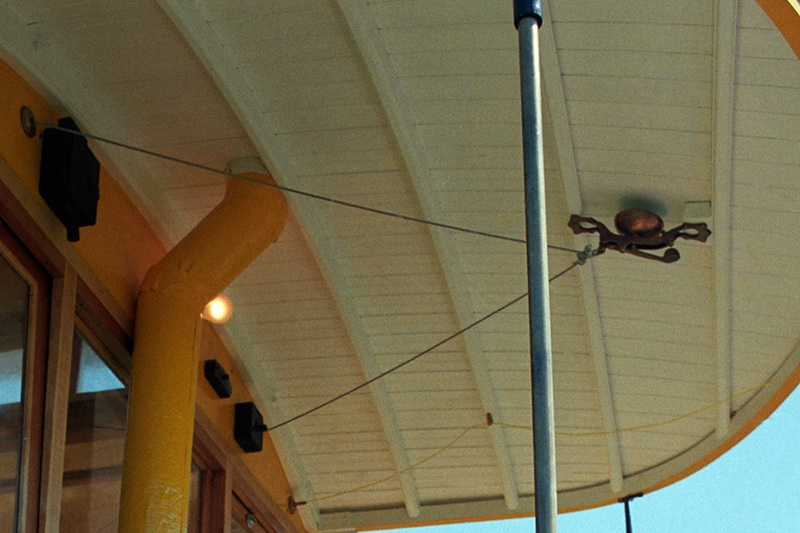 Historical accuracy and attention to detail were key factors in production of the cars. #1601, #1602 - Lowell Historical Preservation Commission, Lowell, Massachusetts. #1976 - Hillsborough Area Regional Transit’s (HART) TECO Line Streetcar System, Tampa, Florida. #1977 - Denver Tramway Heritage Society, Denver, Colorado. 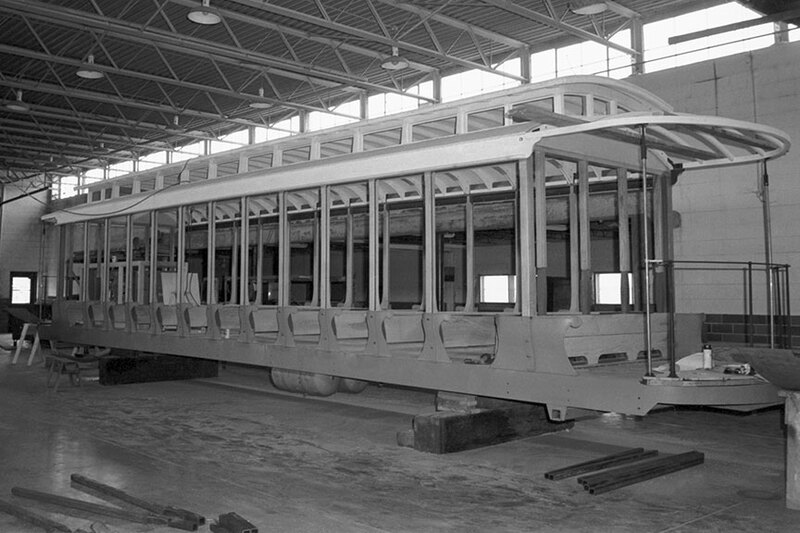 Car Builder: Gomaco Trolley Company, Ida Grove, Iowa 51445. Source of Running Equipment: Melbourne and Metropolitan Tramways Board. Running Equipment: MV 101 motors from Australia, 40 hp., 600 volts, air brakes, and CP 27 compressor. Controls: General Electric K35 controller. Total Crush Load: 90 sitting (does not include operator). Seats: Alternating ash and cherry. 11 walk-over benches. 3 stationary benches. 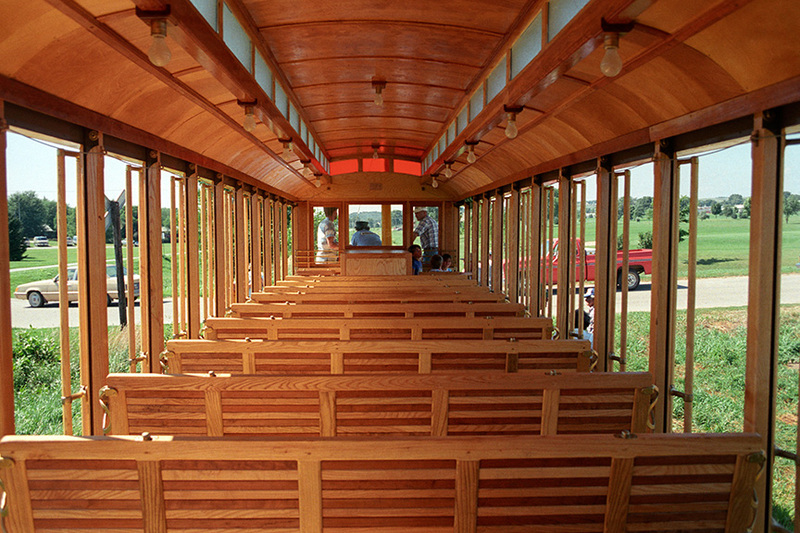 Frame: New steel construction developed by Gomaco Trolley Company. Fittings, Solid Brass: New castings by Gomaco Trolley Company. 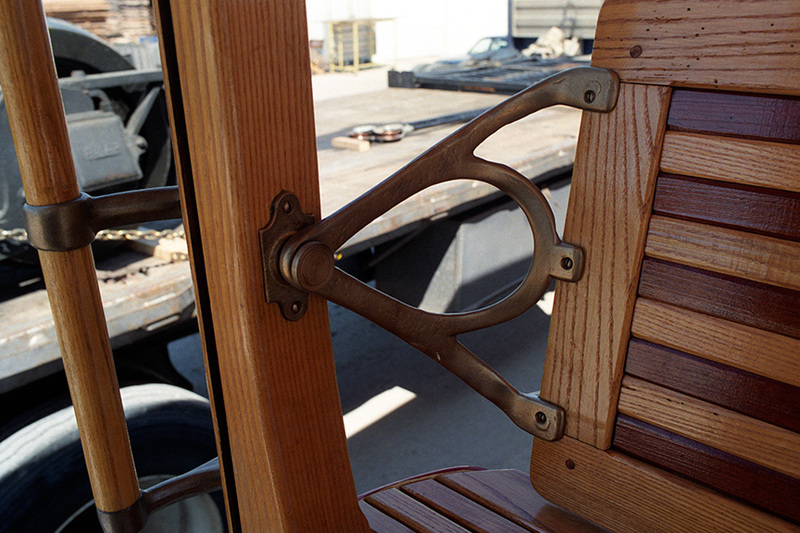 Double grab bars and foot rests - ash. Seat backs - ash and cherry in variegated pattern. Seat end posts - ash. Inside ceiling - birch veneer. Floor - plywood subfloor with grooved maple boards on wearing surfaces, Douglas fir under seats. Running Boards/Steps: Double wood steps, lower one folds. Runs the full length on each side of the car. Paint: Solid green, solid yellow, and solid red. Color and details are selected by customer. Clerestory Glass: Clear red at ends, white glue glass on sides. 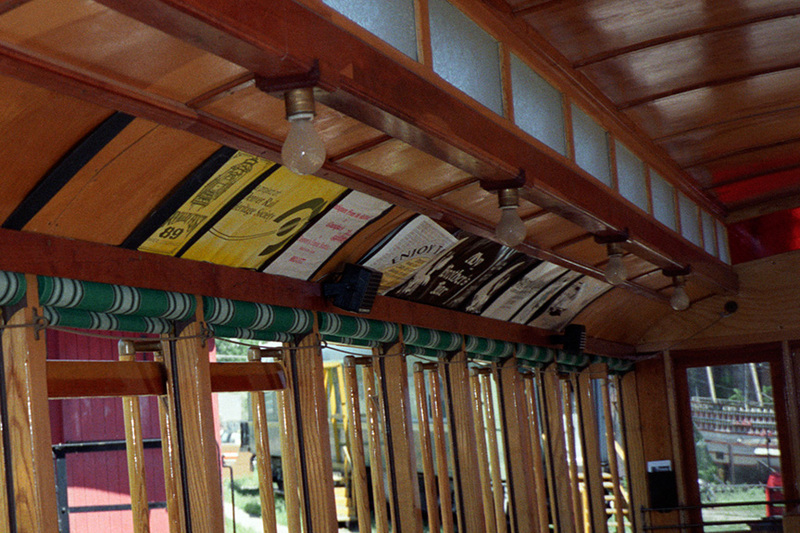 Lights: 11 interior, 2 headlights reproduced by Gomaco Trolley Company. Whistles: Ohio Brass three-tone air chime with WABCO valves. Signal Bell: Brass, made by Gomaco Trolley Company. 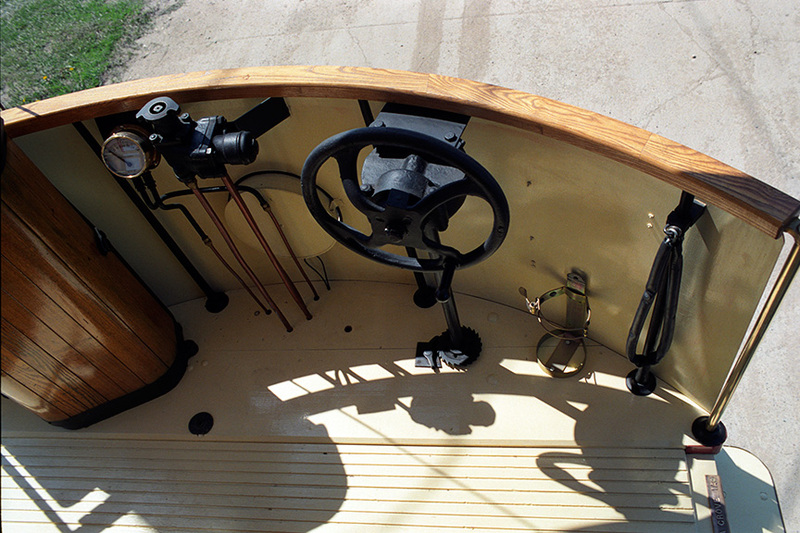 A floor pedal to operate on each end of the car. Floor: Plywood subfloor with grooved maple boards on wearing surfaces, Douglas fir under seats. Ceiling: 1/4 inch birch plywood, varnished and hand pin striped. Roof: Plywood roof with painted canvas cover. Floor plan for the open-style trolleys. 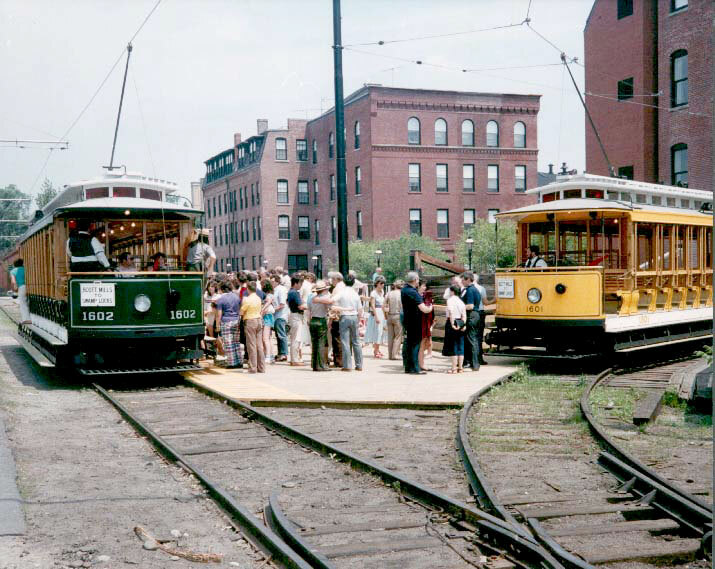 Two 15-bench, open-style trolleys line up for a day of service in Lowell, Massachusetts. 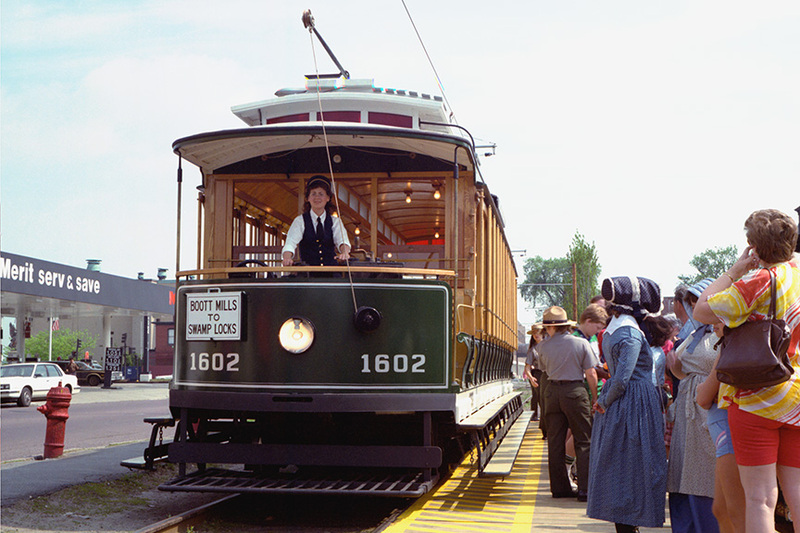 Open-style car #1602 picks up passengers in the Lowell National Historical Park. 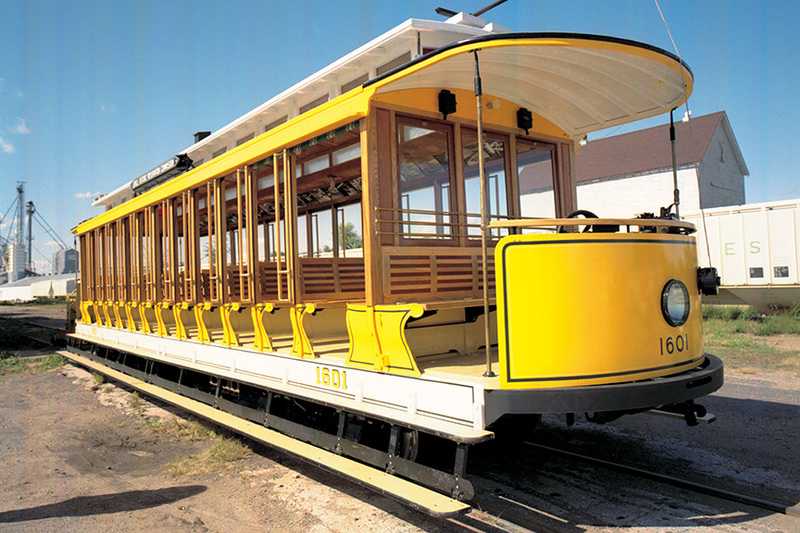 This 15-bench, open-style trolley is running the rails in Denver, Colorado. 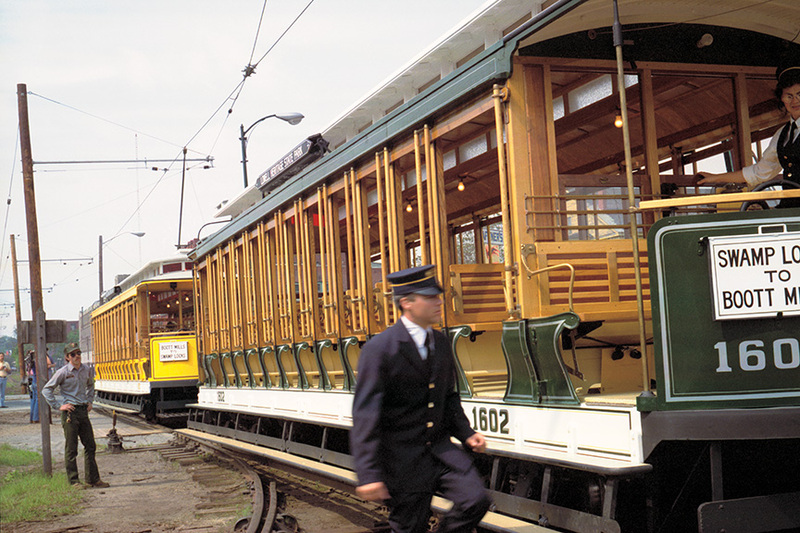 The open-style trolleys are based on the 1597-1600 series cars manufactured by the J.G. Brill Company. The ceilings are varnished and hand pin striped. Advertising panels line both sides of the ceiling. 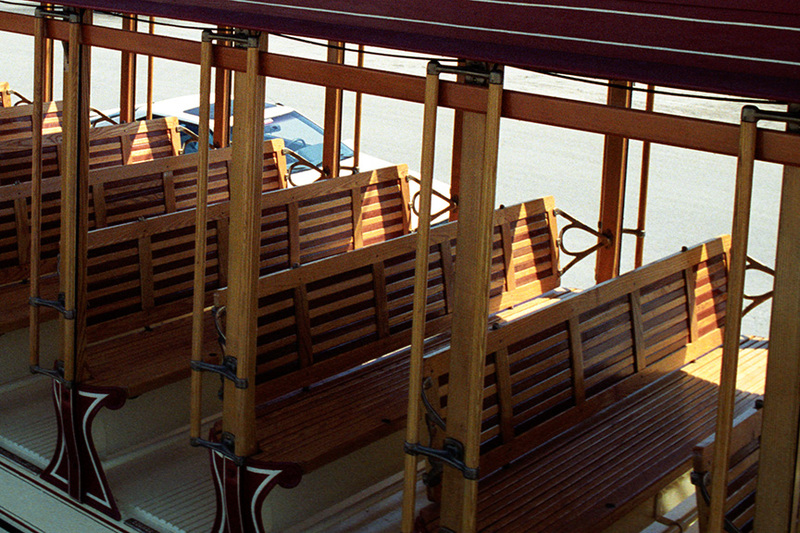 Open-style trolley #1976 is currently in Tampa, Florida. 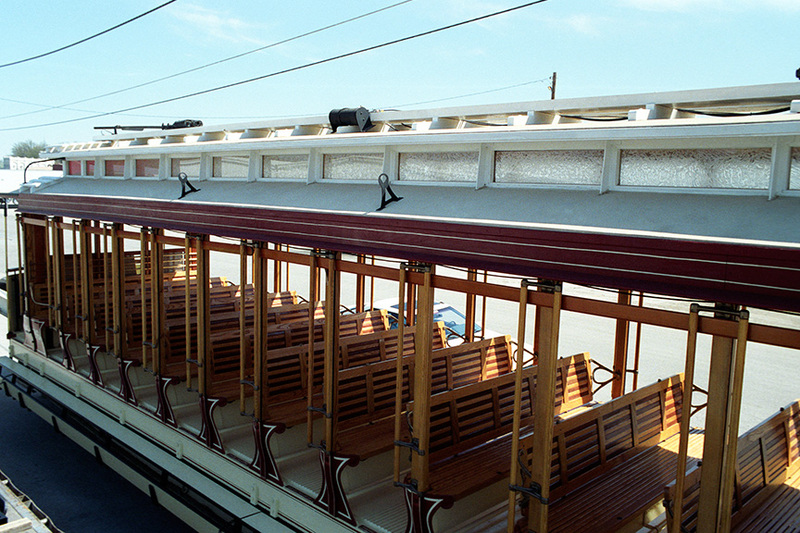 Two running boards, which are the length of the car, provide passengers with steps to load the trolley. 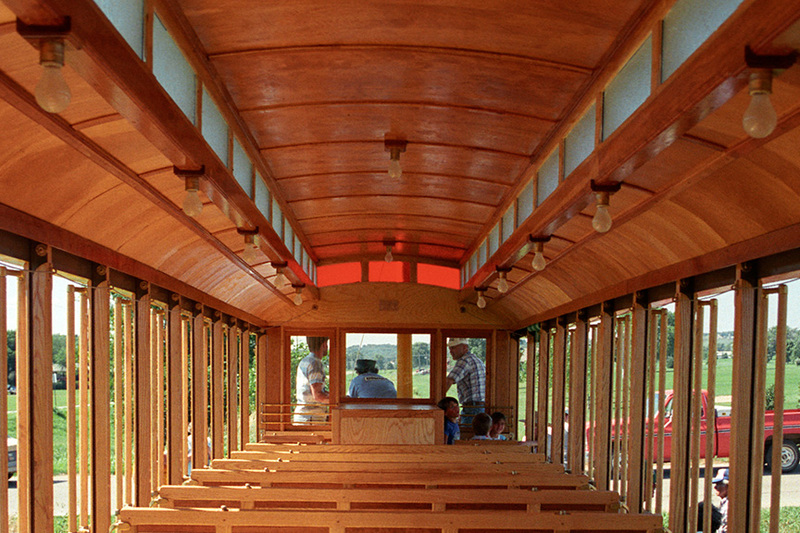 The walk-over benches are constructed of alternating ash and cherry woods.